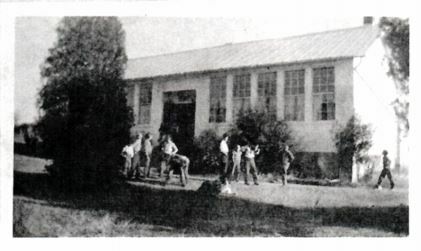 Photo of the Fairview School from the 1954 Annual. 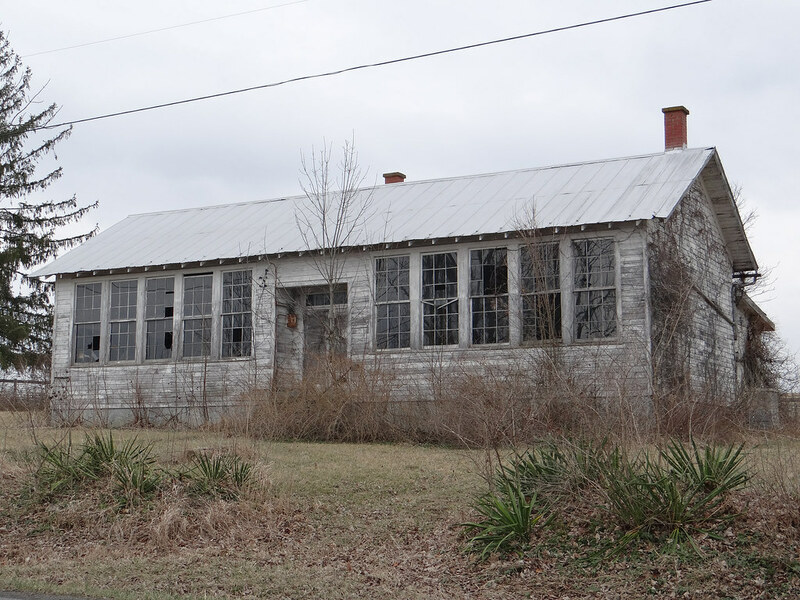 The two-room Fairview School was located near Pickaway on US 219, about 3 miles south of the Greenbrier/ Monroe county line at Second Creek and about 5 ½ miles north of Union. This is the fourth building for Fairview School in the Monitor area, each school being at a different site. The first being started in the 1800’s. 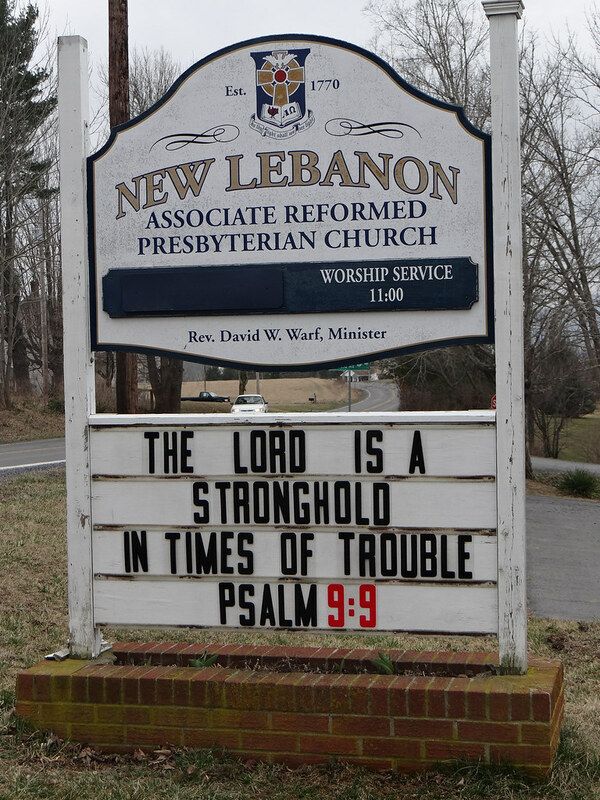 This building was erected 1934, on the upper side of 219, across the road from the New Lebanon Associate Reformed Presbyterian Church and beside the original manse for the church, now privately owned. The school was closed in 1966, but the building still stands in 2014, a sad relic of its former vibrant self: broken windows, peeling paint. But 60 years ago it rang with the voices of happy vibrant children. The Fairview School currently sits across from the New Lebanon Presbyterian Church. A teacher’s brass bell clanged to alert students of the beginning of the school day. Students, in good weather, lined up outside of the school on the walk in two lines (Little Room line and Big Room line). The flag pole was to the left front corner of the building, with the flag being raised to the top of the pole each morning before school and taken down just before school was dismissed. Students placed their right hands over their hearts and said the Pledge of Allegiance to the flag before entering the school. At the top of the entrance steps to the school, the room to the right was known as the Little Room (grades 1-4). The room to the left was known as the Big Room (grades 5-8). The teacher for the Big Room was also the principal. In each room lights hung from the ceiling in white globes. There was a cloak room for each room placed in between the big and little rooms. There was a hanging light in each cloak room. In the cloak room there were hangers along the wall for wraps (coats, hats, scarves, etc. ), with boots being placed on the floor below and a shelf above for lunch boxes, book bags, and the such. The clay water cooler with lid was placed in the cloak room where students could get a drink from the spigot. Some students had a folding metal cup for drinking, others would fold notebook paper into a cups (two styles). Bead board was along the walls of each room, covered with dark varnish. Book cases were set under the tall, expansive windows in each room. Text books and library books were placed there along with school supplies. Student seats were nailed to boards like runners. Each desk piece had a fold down seat in front and the desk attached behind the back of seat. Some desks had a circle sawed out to hold ink wells. A slot near the top of the angled desk was made to hold a pencil. Underneath each desk top was a compartment where books, tablets, and school tools were stashed. Many desk tops collected initials from students over the years through the use of sharp objects. Different size desks were used for different grade levels, the smaller desks for smaller students etc. Bare floors were oiled two or three times a year, mainly to keep the dust down, usually on a Friday afternoon before a holiday. Floors could be slick for some time after they were mopped with oil. The fumes stunk to high heaven. Two outhouses were located at the farthest back corners of the school playground, boys to the left, and girls to the right. It was a cold walk when the weather was not friendly. Periodically a new hole was dug in the vicinity and the building would be moved over it, with dirt from the new hold covering the old one. A coal house was located to the right of the school building near the yard of the manse. Coal was used to heat the pot bellied stoves in each room. Teachers managed the stoves in their rooms, with the help of students in the upper grades. There were ashes/cinders to be carried out as well as coal to be carried into the school in the coal bucket with an angled outside flat lip on the front end of the bucket, so that coal would easily fit in the stove door for pouring the amount desired into the stove. Among the framed pictures that were hung above the chalk boards were those of George Washington and Jesus. Chalk boards seem to be in constant use by teachers and students. Students who behaved well got to wash the chalk boards with a wet rag at the end of the day. The rag had to be clean of dust or the dust from previous washings would simply smear onto the chalkboard. Students vied daily to get to go outside and clean the erasers at the end of the day. Erasers were about 3“ x 6” by 2” tall. They were thick pieces of felted fabric sewn together at the top to make the block shape. After long periods of use erasers fanned out at the bottom a bit. Outdoors, boys and girls would bang the erasers together or pound them on the outside of the building to clean the chalk dust from them, so they would be ready to use the next day. Students picked up papers on the floor, put trash in the stove, and swept the classroom at the end of the day. Until the late 40’s there was a cook house beyond the coal house. It was a shell of a building covered with tar paper on the outside and a bare wood floor inside. Students always wore their coats and boots when the weather was rainy or snowy and cold. Tables and benches welcomed the children for their lunch meal, of course after Grace was repeated by the students and teacher. The smell of the freshly cooked food was enticing. Mrs. Allie Deskins was the cook. She was always meticulous in her white, starched dress, with a handkerchief in her dress left chest pocket. A pretty homemade apron was worn over her “uniform”. The stove was heated by wood for cooking. In the late 40’s a new lunch room was constructed and attached to the back of the school. A cistern collected water as rain fell on the roof of the school. Clorox was added periodically to purify the water. Doors were cut from each classroom cloak room to into the new lunch room. Students could finally go to the eat lunch room without walking out into the weather. When the weather was pretty students had the rest of the lunch hour to play games on the playground. “Ring around the Rosey”, “Squirrel in the Tree”, “Drop the Handkerchief”, and “Red Rover” were among games enjoyed by school children. Lunch hour was a free play time with students organizing their own games and often making-up their own rules. Conversations between students were the main components in squaring up their activities and creating their rules for the activity, especially when there were too many or not enough to make the game move smoothly. Some students played ball or swung on the swings. The swing set was up on the hill between the outhouses. Little girls might choose to make a house with pine needles under the pine trees, creating rooms and playing with dolls. Older girls sat out under the big tree across from the church, probably to chat about the boys and wave at “passers by”. The tree roots made steps from the bank down to the road, where students were not allowed to go. There was a 15 minute recess in mid morning and mid afternoon. Sometimes there were games played, sometime it was free time, but most especially the time was for making a quick visit to the outhouse. Teachers were very busy keeping four grades of curriculum progressing in each room, as well as making sure the room was comfortable. Students always had independent work to do while not in a reading group. Spelling and math assignments were copied from books on to their tablet or notebook paper. Many assignments had to be copied off the board. Art was usually for creating decorations to create a border for the chalk boards, bulletin boards, and windows, then came drawing and coloring for joy. Music class was on the radio, WRON, by Mrs. Alma Hogsett from Greenbrier County. Students sang along with Mrs. Hogsett on the radio. She taught some fundamental music theory during this radio program. Teachers could then follow up with the concepts and aspects from Mrs. Hogsett’s informational follow-up sheets, if they so desired. Teachers used a hectograph to make copies of work sheets or pictures to color for the students. This was a jello type substance in a tin pan that a master copy was pressed and rubbed on for a certain amount of time. The ink from the master copy would adhere to the prepared gelatin after a few swift rubs. Then blank sheets of paper would be placed on top of the gelatin surface, one after another. Before pulling a sheet off one would lift a corner to make sure the transfer was dark enough. It would copy whatever had been set on it from the master copy. With each copy the picture or message got lighter. After making some 20 copies the lid was placed back on the pan. The hectograph would then have to set for a period of time before it could be used again. The ink would soak to the bottom. Periodically the teacher would have to clean out the tin and make a new batch of prepared gelatin. Yearly school events altered the everyday ritual for normal studies. A pie supper was held each year, usually on a Friday evening, to make money for supplies and to have school and community fun, in cooperation with the PTA. A Christmas play was held each year, with the big room being turned into an auditorium. The stage was created at the front of the big room. Wire was hung from the window side to the opposite wall. From the window to wall wire two wires, attached about six feet from each end, then those two wires were attached to the back wall creating side stage areas and from the wire to the back wall, creating a stage. Curtains were created by hanging and pinning sheets on the wires to create a stage and side stage areas. Each student had a part, whether it was a character part, singing carols in a group, reciting a poem or becoming a silhouette. Costumes were very inventive. There was lots of memorizing and practicing. Monroe County began a bookmobile in the mid 1950’s. Students loved to go across the road periodically to pick out books from the turn table in the back of the van. Books could be kept and read until the next bookmobile visit. Mr. Sibold took students in the back of his pick-up truck to explore local caves and play soft ball at other schools. His wife would come to school occasionally to teach dancing to the boys and girls in the big room. Some of the later teachers at Fairview School were Miss Ada Young, Mr. Edwin Sibold, Mrs. Lura Reed Hoke, Mrs. Madeline Cook Gilchrist and Mrs. Christine Shires Nichols. Dixie attended Fairview School in the late 1940’s and 1950s. Teacher Lura Reed Hoke was her mother. Dixie’s family has lived in the Second Creek community in Monroe County since the early 1900’s, with ancestors from all sides living in the Second Creek Watershed since the late 1700’s and early 1800’s, many generations. She is a “Reed’s Mill” Reed – see our story about the mill and her cousin, Larry Mustain here. Thanks to Dixie and all the other contributors whose family and personal stories deeply enrich the Traveling 219 experience!